As reported in an earlier article, Ford are bringing back the Mustang GT Shelby Super Snake for 2017 as a 50th anniversary tribute to the original. Now you have the chance to see their promotional video for the wonderful vehicle as shown below. The 1967 Shelby Super Snake took centre stage in the remake of ‘Gone in 60 Seconds’ in the 2000 movie, featuring Nicolas Cage(Memphis Raine) who named the vehicle ‘Eleanor.’ Now the car is back in all its glory in 2017 with only 500 units being produced. 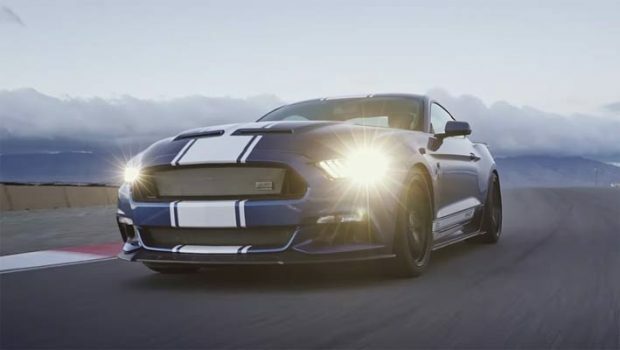 The vehicle will have all the traits of a Super Snake with a 50th Anniversary Super Snake nameplate and Carroll Shelby signature, along with all the enhancements attributed to a GT. The car will feature a 5 L coyote V8 engine putting out 750 HP and 700lb. feet of torque, with a 0 to 60 mph time of 3.5 seconds and a quarter-mile times 10.9 seconds. That’s going to be more powerful than the current Dodge Challenger and Charger SRT hellcat and the Chevy Camaro ZL1 and will have a pricetag of $69,995 or $36,795 not including a Ford Mustang GT for the upgrade. Copyright © 2018. All rights reserved. Fastmusclecar is a participant in the Amazon Services LLC Associates Program, an affiliate advertising program designed to provide a means for sites to earn advertising fees by advertising and linking to amazon.com.